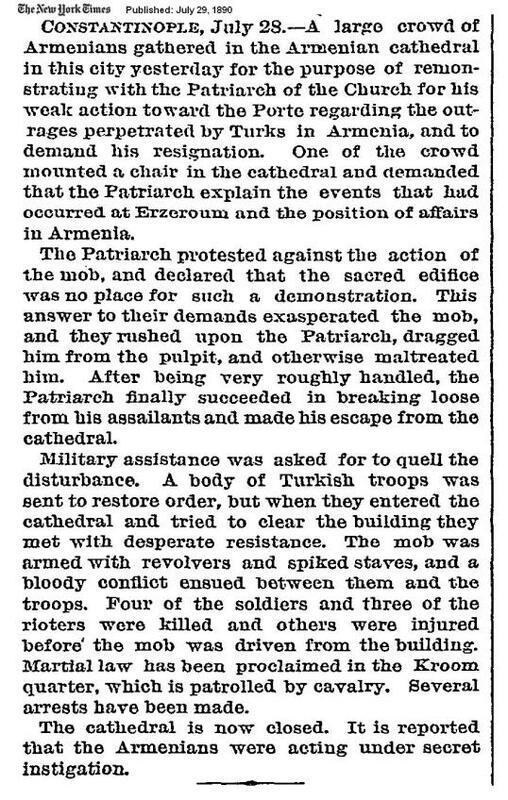 1886) NYT: 18 Oct 1915 : -Dangerous Rebel Armenians Betray Their Rulers, Take Refuge in Christian Missions : The Kind of Armenians A Turk Knows"
1884) NYT: 22 Nov 1915 : -Rebel Turk Djemal Pasha Orders 2 Turkish Band Chiefs Be Hanged For ill Treatment of Armenians"
1883) Nyt:14 Nov 1920: -Armenians Complain Of French"
1882) NYT: 13 Nov 1914 : -Turkish Armenians Refuse To Join Turkish Army - Ready To Join Russian Invaders for Armed Revolt"
1881) NYT: 2 May 1928 : -Huncak (Agitates Against Turkish Rule) Editor S Sapah-Gulian Dead"
1880) NYT: 15 Dec 1903 : -Armenian Revolt Likely"
1879) NYT: 4 Aug 1940 -Armenian Military Hero, General Sebooh Arshak Nersesian, Who Fought Against The Turks In 1920, Died At 66"
1878) NYT: 22 Jun 1935 -Armenian Patriot Miran Sevasly Dead: He Helped Raising 10.000 Armenians To Fight Against Turkish Front In Armenian Legion "
1877) NYT: 8 Jan 1915 -Armenians From America, Arrived In Tiflis, To Serve With The Russian Army Against Turkey"
1876) NYT: 9 Oct 1915 Why We Aid Armenians: It's Because We're Bought by Anglo-French Gold"
1875) NYT 13 May 1947 James Chankalian, Won Honors, in Organising 300 Armenian Volunteers To Fight Against Turkey"
1874) NYT 29 Sep 1915: Armenians Brought Reprisals on Themselves by Trying to Stir Up Rebellion Against Turkey"
. . More To Be Added . 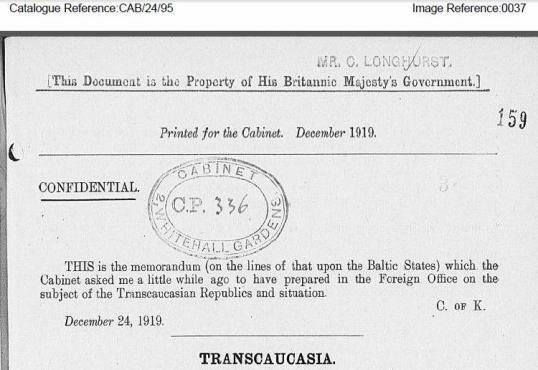 . .
For once, actual solid evidence of what was going on during those times. 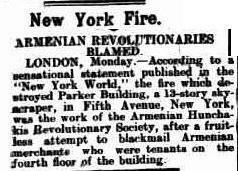 If the newspapers were from resources such as Turkey Times, I might have felt doubt, but most of these newspapers are from American newspapers such as the NY Times. 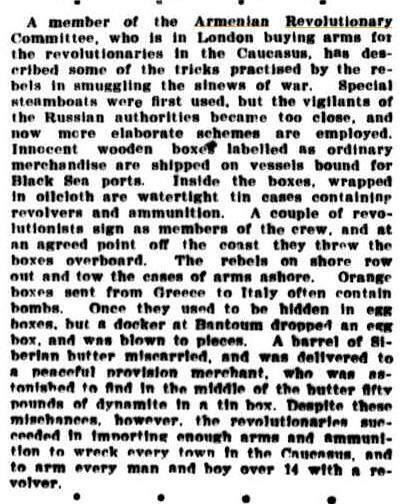 In response to the previous comment, what makes these records so powerful is that U.S. and Western publications were generally hostile toward matters Turkish. 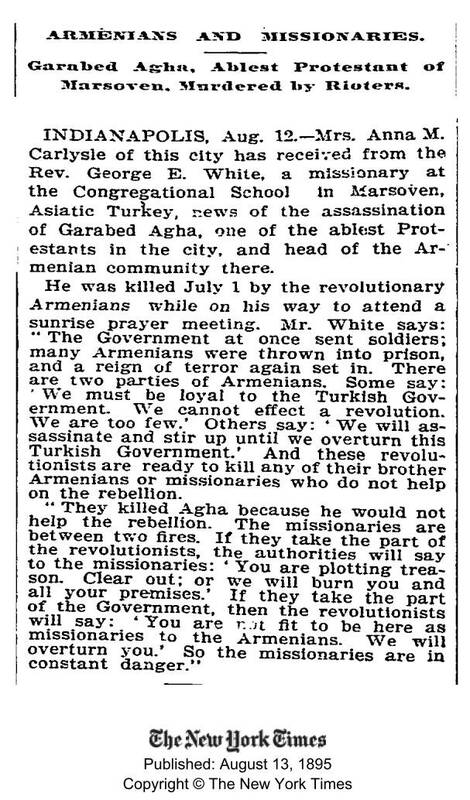 In other words, as impressive as it is for newspapers such as the New York Times to occasionally provide the truth about the Armenians, equally unreliable was their far greater pro-Armenian coverage, based on the flimsiest and/or most propagandistic of sources. The perception that whatever appears in a Turkish publication must be observed as a lie reflects deep prejudice. Truth may be reliably determined by the soundness of whatever sources that are presented. 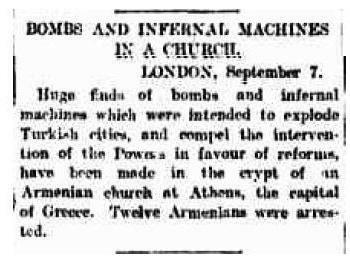 * ‘The Armenians ejected sulphuric acid to the faces of the Turkish people, fired their houses and killed them using knife and bullet, in Gaziantep’ (Report of English Ambassador Henry D. Barnhamof Aleppo –Halep-, dated 16 November 1895). 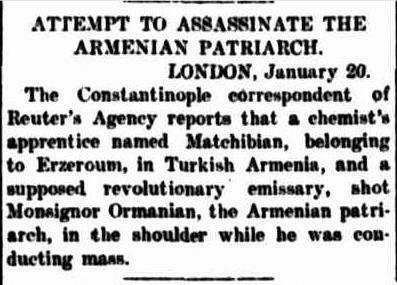 * In 1905, the Armenians killed all the Turks and Muslims who lived in Susha in Azarbaijan (Russian newspaper Novoye Obozrenye 6 September 1905). 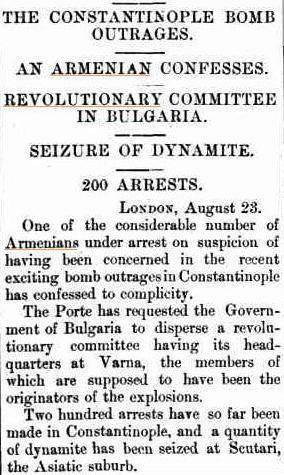 courage to massacre Turkish women, children and ill and old people (Contrarevolyutsionnıy ‘Dasnaktsutyun’ İ İmperialisti-cheskaya Voyna 1914-1918 gg.’, Revolyutsionnıy Vostok, No.2-3, p.92, 1936). * V.A. Gurko-Kryajin declared that the Muslim folk around Yerivan and Kars were eradicated and the districts Shuragel, Kağızman, Karakurt, Sarıkamış, Surmali were fired and destroyed so that the folk were forced to escape, in his book entitled ‘Neareast and the States’ (V.A. Gurko-Kryajin, Blijniy Vostov i Derjavı, p.93, Nauçnaya Assotsiatatsiya Vostokovedeniya Pri TsİK SSSR, Moscov, 1925). *T. Hachikoglyan, in a speech he delivered, told that the Dashnaks eradicated thousands of Turks with their bloody hands (T. Haçikoglyan, 10 Let Armyanskoy Sttrelkovoy Divizii,p4-6. İzdatelstvo Polit. Uprav. KKA, Tiflis, 1930). 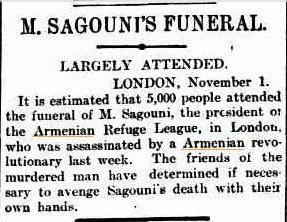 ‘Dashnagzoutiun Has Nothing to do Anymore’ that they massacred the Moslem population and the Armenian terrorist acts were directed, at winning the Western public opinion and the British occupation aroused hopes of the Dashnaks. (This book is banned in Armenia). 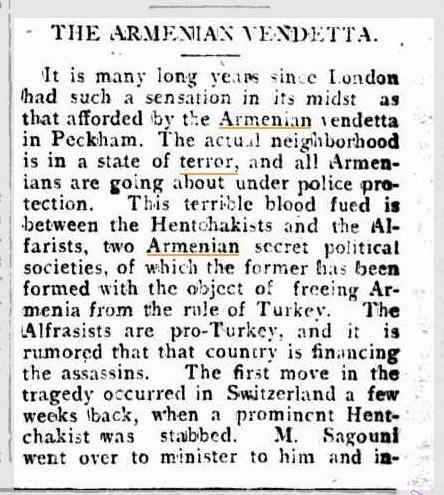 In the following video http://armenians-1915.blogspot.com/2008/10/2616-armenian-forgeries-exploitation-of.html, in Picture 1, you will see a woman presented by the Armenians as a woman slaughtered by the Turks. This picture indeed belongs to a Jewish woman butchered by Nazi Arrow Cross Men Party in Hungary (The Mazal Library). The second picture shows heads decapitated allegedly by the Turks. This picture indeed belongs to White Rose activists who fought against Nazis in Germany during WW2. These activists were sentenced to death and killed via guillotine by Nazi Germany. *****The fifth Picture shows two male that has been killed allegedly by Turks. This photo belongs to two Turk killed by Armenians in Erzincan Odabaşı (in Otoman Empire). Their eyes have been craved off them before they died. Original photo is in Turkish Archives. The sixth photo shows allegedly Armenians slaughtered by allegedly Otoman Armenians. The uniforms of the soldiers in the Picture belong to Russian soldiers fighting in Russian Civil War after WW1 and not to Otoman soldiers. This Picture is not related to either Ottomans or Armenians. 1)The cover photograph of the book of Tessa Hoffmann: German Greek scholar Tessa Hoffmann printed the painting of Russian artist Vasili Vereshchagin entitled ‘The Apotheosis of the Franco-Prussia War of 1871, depicting a mass of skulls which was probably painted after 1878, as if it were the photograph of 1915 Armenian genocide, in the cover of her book and had to admit her forgery during the trial of Doğu Perinçek held in Switzerland in March 2007, in which she was listened as a wittness. 2) Atatürk’s photograph: The large poster with ‘FACE OF DENIAL-DOES NOT LIE’ related to a conference given by Dr Vahram Shemmasian, Ardashes Kassakhian and Dr Levon Marashlian, at UCLA on April 14, 2005, organized by Armenian Genocide Commemoration Committee of Alpha Epsilon Omega, (http://www.genocideevents.com/cities/losangeles.html. The photo depicts the founder of the Turkish Republic, Ataturk, sitting on a chair outside a house with the corpse of a young girl with her innards exposed to the elements. Soon, the original of this photo was found by the Turks: It was a photograph of Ataturk for his wife Latife Hanım as a souvenir, posing with some ‘cute dog puppies’ at his feet. Two photos were printed in the July 1, 2005 issue of Hurriyet (http://webarsiv.hurriyet.com.tr/2005/07/01/665930.asp), as ‘a forgery scandal’. It is another outstanding point that no dissenting comments were ever heard. What UCLA’s ethical committee did was to erase the handwritten note and doctor a photo of Armin Wengler in place of the puppies. Nobert Yevdayev, editor-in-chief of New York-based Russian language newspaper “Noviy Rubezh” (‘New Frontier’) and chairman Azerbaijani Friendly Association AZEM spoke in an interview with Day.Az said : ‘Photos of victims of Khojaly genocide allegedly to be victims of so-called “genocide” of Armenians in the Ottoman Empire were published in the newspaper ‘In a New light’. We contacted the editor, invited him to the Mission of Azerbaijan to the UN where he had to apologize for the correspondent who resorted to such provocation’. Today az, 4 September 2009. 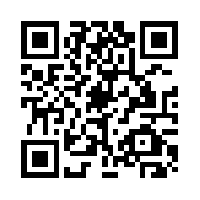 Thank you site managers for this wonderful resource. I am now using it in my power point presentations. One picture is worth a thousand words they say. 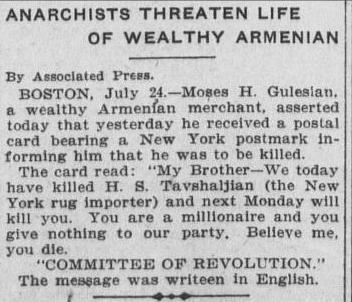 What about an old newspaper clipping? A million? is the same newspaper article, no 26 cannot be read properly, so it can be deleted, Thank you. We appreciate your kind help. 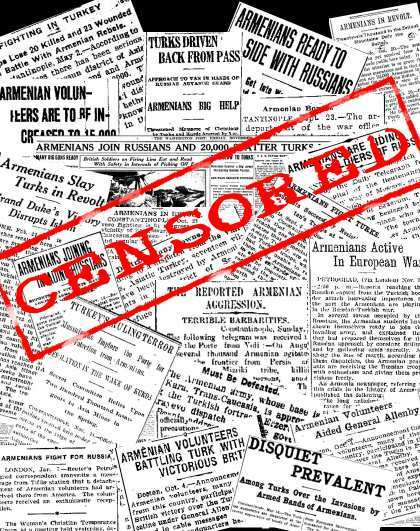 no.44: 2151) Examining a 1914 News Item: "Armenians Aid Russians"
is the same newspaper article, no.44 cannot be read properly, so it can be deleted, Thank you.